It’s summer and there are really only a few things I want to do every week. Sip my summertime cocktails and dine out alfresco, sometimes barefoot. Okay, I really want to do this every day. Homemade dinners every night, made on the grill, settling down with the sun. Sigh. A girl can dream. If you saw my last post on Summer Favorites. You have an idea how I am feeling. If not, I am here to remind you, always and forever. Okay so now let’s talk food. Ever have those dishes or cuisines that scream summer? I’m talking cold Italian pasta salads, Mediterranean hummus, cheese, and vegetable platters, hamburgers and hot dogs straight from the grill. I just had my first hot dog in over a year and OH MY GAAAHH, so good. I like to go all out because sometimes you need to be a little bit extra, so I topped it off with baked beans, raw fermented sauerkraut, and yellow mustard. One of the better decisions I made recently. As for Mexican food. Once the weather warms up, give me all the tacos, all the time. It’s one of my first cravings come summer. Sweet and savory elote, fajita with fresh peppers and onions, guacamole, agua frescas... I could most definitely go on, but then we start getting complicated. And hungry. I’m a girl who makes decisions on dinner based on the type of cuisine, if you haven’t noticed. For now, we are keeping it light and simple. I found myself this summer experimenting with new ideas and recipes, more than I have in years. Maybe it’s the abundance of vegetables in season or a little kitchen therapy after a long day, the outcome hasn't been so bad. Also, I am trying this thing called recipe testing and photography as I go. Giving you that in-the-moment effect of what’s really going on in my kitchen. A bit of that homestyle cozy feel. A Latin healthy spin on a Mexican dish, using sofrito from Puerto Rico (or my kitchen), a filling similar to Cuban style congri, and topped with a little queso blanco and cilantro for a wellness balance. Both easy and delicious you cannot go wrong. I used a grill, but an oven should work out just as well. *PS. Make the sofrito ahead, while using leftover rice and bean. Save time. Enjoy! Blend, jar, and enjoy! Holds for three weeks in the fridge or months frozen! To cook black beans, heat over medium high about 2 tbs of olive oil. Add the sofrito and cook for about a minute, then add the tomato sauce and cook for another 2 min. Quickly rinse the black beans before adding them in. Add about another ½ cup of water, the spices, and bring to a simmer for 10 minutes. Lid closed. 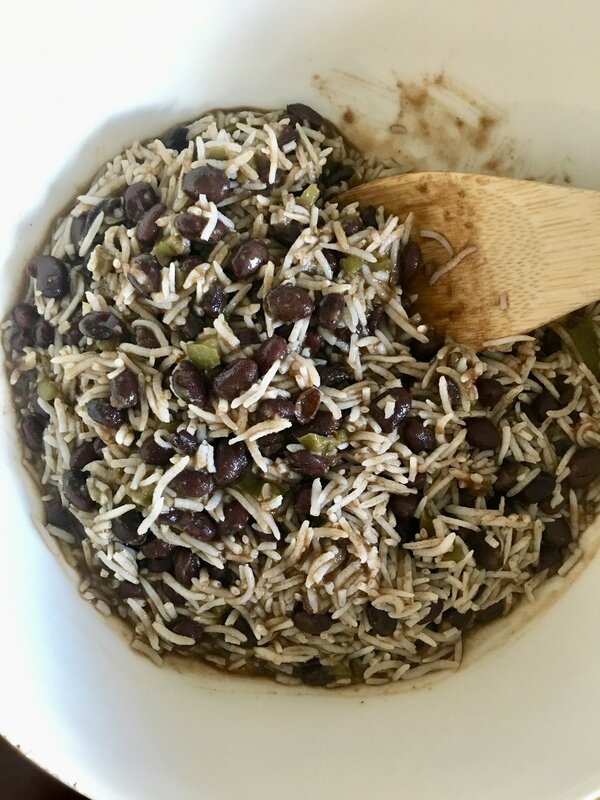 Mix together rice and beans. Add a little salt and pepper to taste. It should be very moist (don't hate me) or wet looking. This will ensure no dryness when cooking on the grill. Oil and salt the bell pepper halves inside and out. Distribute the rice and bean mixture into the peppers. Lay on baking sheet with foil. Transfer the peppers still on the foil onto the grill. Cook for another 10-15 or when the peppers start to brown and look soft.